Editor’s Note: Eat Drink Boulder was invited to attend a Chipotle grand opening event for their new catering business and writer Allan Parr attended. We were not paid for this article but Allan did receive free food – although anyone who drives to Denver for a burrito is not doing it for a freebie. Our goal was to write an article about Chipotle’s new, revolutionary business model revolving around catering but the model turned out to be typical to other businesses so our writer chose to present his opinion about Chipotle’s food. Ever been to a “CostCo party”? The giveaway is the huge, round, injection-molded plastic food tray with its individual pods. Each depression has a neat pile of baby carrots, broccoli florets, cherry toms and sugar snap peas surrounding the vat of khaki-colored hummus in the middle. Occasionally, the more extravagant shopper will supplement the veggie platter with a goat-head-sized wedge of Rembrandt cheese and a few sleeves of rice crackers snaking like Chinese parade dragons on the serving dish. Cheap and easy: check. But if this is your idea of a tasty spread, you may as well call yourself Jen Eric Kirkland. Think about it. These well-meaning party throwers may not be evil, exactly, but the grub belongs in purgatory. So, don’t get sucked into blandville. 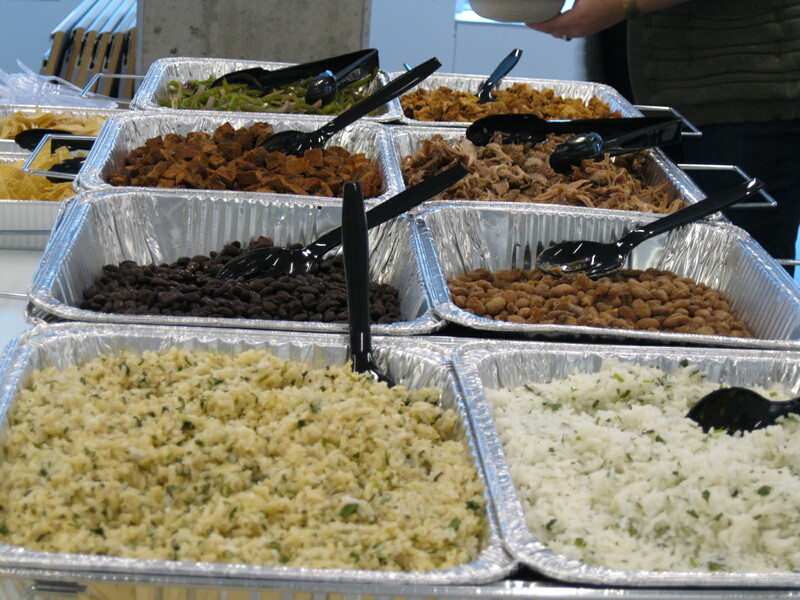 Instead, here’s an idea: serve a buffet of hand-made Mexican goodness at your next gig. Have a bunch of face-painted maniacs coming for the Super Bowl? Call your local Chipotle, tell them how many mouths you’re feeding and choose what you want. The premiere “catering” package is “The Big Spread” if you have 20 or more peeps. You choose 3 meats, and then you get a boat-load of all the trimmings including guac, salsas, beans, rice, tortillas, chips, fajita veggies, etc., at $13.50 per person. Other deals for smaller parties are available, because unless you are really scarfing, that’s pretty steep for burrito fixings. The process is nothing to write home about: call 24 hours in advance, pick up the food (in Boulder that means 9th and Pearl, or in the 29th Street Mall), throw it on your table using the included tray stands and Sterno cans, then proceed to chow down. Return the tray stands and get a free burrito. Nothing heroic or gourmet but it is hot, hearty, and crowd-pleasing. Or…run down to CostCo and pick up the giant vinyl veggie carrousel and maybe an oatmeal-colored, knit polo shirt and a lifetime supply of milquetoast. Man, I love me some corn!